Price includes tax preparation and printing of federal tax returns and free federal e-file of up to 5 federal tax returns. Additional fees apply for e-filing state returns. E-file fees do not apply to New York state returns. Prices subject to change without notice. - TurboTax coaches you every step of the way and double checks your return as you go to handle even the toughest tax situations, so you can be confident you're getting every dollar you deserve. - Up-to-date with the latest tax laws - so you can be confident your taxes will be done right. 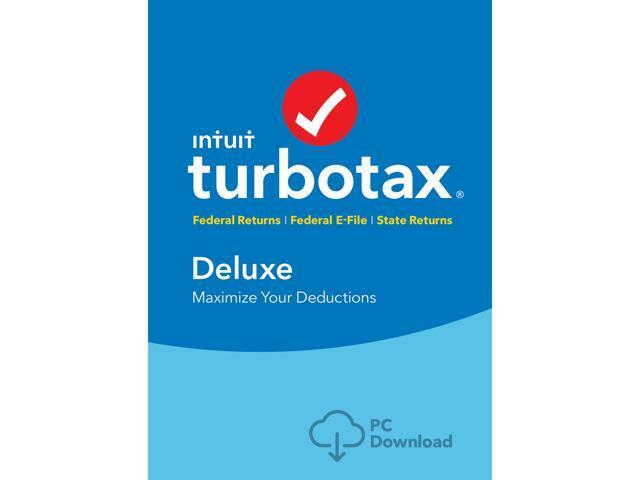 Below are the minimum requirements for TurboTax Deluxe Federal Plus State 2018 software installed on a Windows computer. Operating System: Operating System: Windows 7 (Service Pack 1 or latest) / Windows 8 / Windows 8.1 / Windows 10. Windows Vista and below not supported. Monitor: 1024 x 768 or higher recommended. Internet Connection: 56 Kbps modem (Broadband connection highly recommended). Required for product updates. Hard Disk Space: 650 MB for TurboTax (plus up to 4.5 GB for Microsoft .NET 4.5.2 if not already installed). Third Party Software: Microsoft .NET 4.5.2 included with TurboTax Installer. Administrative rights required. Printer: Any Windows compatible inkjet or laser printer. Pros: Works. I hope the number are right. Cons: every time you start it wants to update for 5 minutes. Efile state is not included. Still don't see where it says that. They now want $24 for state Efile, seems they go up closer to tax time. I give up with TT. They keep getting worse every year. And fixed deductions makes them moot to me. Other Thoughts: Again, Efile State is not included. They want $20 to let me e-mail the results to the state? This is sad and again, why I will not go this route again. Cons: I thought the state e-file was free. Other Thoughts: I am generally satisfied with TT, but i think it's time they create an online account that wouldn't require me to store all my Turbo tax stuff on my computer. I am definitely getting a new computer this year and will have to either move the files or re-enter all that stuff next year. This online account could store all my tax documents as well and provide one place to store at least electronic copies of all my tax files. I'd also like to see a little more ability to download W-2s and 1099s and mortgage documents electronically. With the exception of Charles Schwab I have to manually enter a lot of my stuff. I just think that in this day and age it should be easier. Still, I like the program and will continue to use it in the future. I filed really late last year and this cost more last year, so costing less is a plus. Cons: Wouldn't install from download until I restarted. Before I restarted, it, it would just extract the exe and do nothing else. On updating for 2018 it sat for a very long time at the 98% mark before finishing. I was patient and let it finish. It asks for basic information at the start which led me to assume it would not import last year's info, but it did. Pros: No issues at all, purchased and got the download email same day. Went online, downloaded and found my previous years tax and info (on same PC). Entered info, everything worked fine, no hang ups at all. I knew the state tax was not efile, since the price was so good, that I knew from using their software thru the years. Efiled my fed tax, accepted the same day. Dont listen to the negative people, they're clueless!! Other Thoughts: I like TurboTax but wow it's difficult to actually pay what you should or what you want to...No idea why I had to pony up another twenty bucks...That said, the program itself is an excellent way to file taxes - lots of checks and balances - easy to follow instructions. I have helped people file their own taxes online, though, and that costs $20 too. So, still in the dark regarding why I would actually need this product! Bought this and realized after the fact that it only includes 1 state eFile and gives NO indication on the Newegg's product page. Customer support was useless, and after putting me on hold 5 times, she attempted to screen share my computer and went through every personal detail (to no avail). Ditched it, and used FreeTaxUSA to file in less than 1 hour. Do yourself a favor and don't buy TurboTax. Cons: -Very misleading advertising. The "State" part that's included is just downloading the state tax forms. You can do this in the online version for free. If you proceed to eFile your state return along with your federal return, TurboTax charges you another $20. -PC version is much clunkier than the online version.